I recently had the chance to paint up and older metal Asmodai Interrogator Chaplain model. 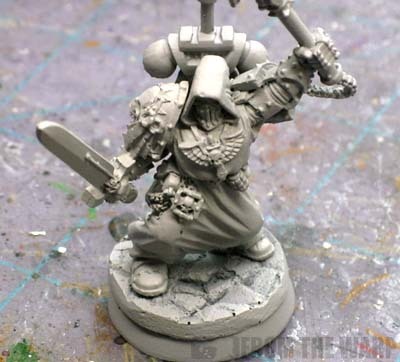 I wish this guy had made it into the Dark Angels codex, but instead we were given the a standard Interrogator Chaplain option. When Topkat from over at The Lead Dragon sent me an email and asked if I would paint this model up for him, I wasn't going to pass up the chance. Like most projects, it came to me partially started. Depending on how much work has already been done, determines how much work I have left once I get my hands on the model. 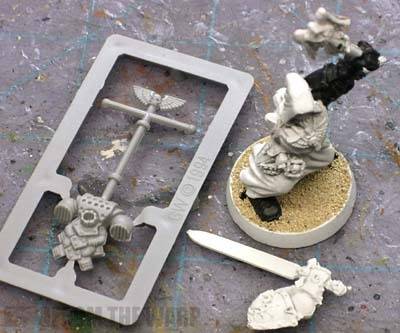 In this case, it was a matter of cleaning off the last of the mold lines, stripping the primer off, rebasing, finishing the assembly and then repriming him. In order to match him to Topkat's existing basing, I went through what I had and pulled out this broken cobblestone type base from Secret Weapon Minis. The other squads he has are on unbroken bases so I thought this one would fit in and still stand out a little bit from the rest. Here I went with the light grey primer since his robes cover most of his body and I didn't want to have to build those back up from black. There were two things I wanted to do with this model when I took the project. The first was to work on the robes (practice for me) and the second was to work on another method for painting black armour. Not actually another "new" method, but an alteration to one I tried earlier on a previous model. When it comes to painting robes for me, it's about layering. Whether I do three or a dozen layers, I try to get the transitions between colors smooth. I've found that the more layers I add and the more subtle the transitions, the better the final model looks most of the time. With this guy, I did six steps to get from the shadow of GW Calthan Brown up to a layer of thinned white on the uppermost points. I forced the lighting effect by highlighting the upper portions of his knees, top of his hood and his shoulders only. The picture doesn't do it justice in this case as the transitions really push the effect in real life. It comes as no surprise that I've tried all kinds of methods for painting black, a quick look through the Archives will show that. In this case, I wanted to expand on a method I used when I painted up a Legion of the Damned trooper for another friend of mine. I started with a black basecoat and "highlighted" with P3 Coal Black. Only this time, I didn't want the color to be so bright. I wanted it even more muted and have it more like a hint of color more than anything else. I did this by blending the Coal Black color into the black using a zenithal type approach and then going over the whole thing with a wash of GW Badab Black to darken it down. After that, I took GW Adeptus Battlegrey and did a tiny bit of line highlighting along the uppermost edges to make them pop. I have to say, I really like how the model turned out and plan on using this technique again when I get the chance. Just the fact that I got the black armour the way I wanted was a big win. The banner was good practice for me as well considering I haven't done a proper one for a long time now and miss painting them. I had to go all the way back to the second edition codex to find this one. 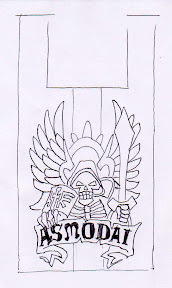 There's a tiny picture of the completed banner on a model in the previous Codex, but nothing you can work from really. You can see how large I drew mine before I scaled it back down to size. The one I'm painting is on the right and it's only 5/8 of an inch wide. That's like 15mm for you guys on the other side of the pond. 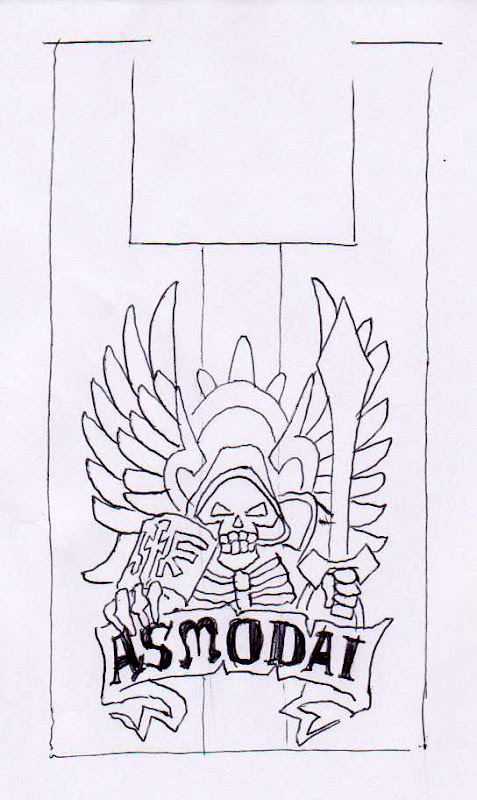 Here's the outline drawing I did for my banner for anyone who wants to use it in their Dark Angel army. You can click on the image for the larger version and save that to your computer. From there you can print it out and reduce it until you get it the size you want. The top tabs can be cut to length and bent over the crossbar of your banner pole. Just make sure it will fit before you go painting the whole thing up. You don't want to find out it's too big to fit on your model once you've invested all that time painting. I love banners on character models because I think they add so much to the model. They're so over the top and fit in perfectly with the 40k universe. Impressive! I'll have to utilize the cloth painting more often. I'm excited to see the finished model! *sigh* I miss Asmodai... GW!!! BRING HIM BACK!!! Really love the model. Perhaps if I ever have time/creative interest, I'll convert my own plastic version. Robes look great thus far. 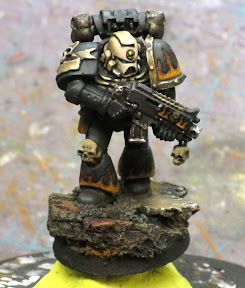 Nice work Ron.Whilst were on the Dark Angels theme may I ask when were gonna be seeing some more Deathwing? Great - can't wait to see more!! 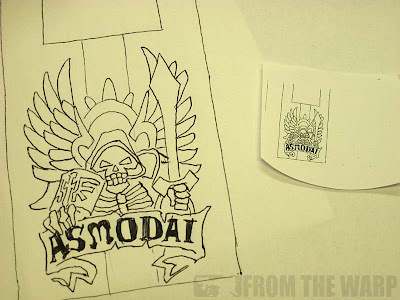 Ron, in the event you're interested I have the old rules for Asmodai in .PDF form. Also, thanks for the help with the robes =D, it's going to give new life to one of my librarians. Thanks for the heads-up on the balck armour: I'm doing a LoD-army as a commission now, and have been struggling wioth this as well. You added the final step I missed: the Black Wash. Simply brilliant...Why didn't I come up with that??? 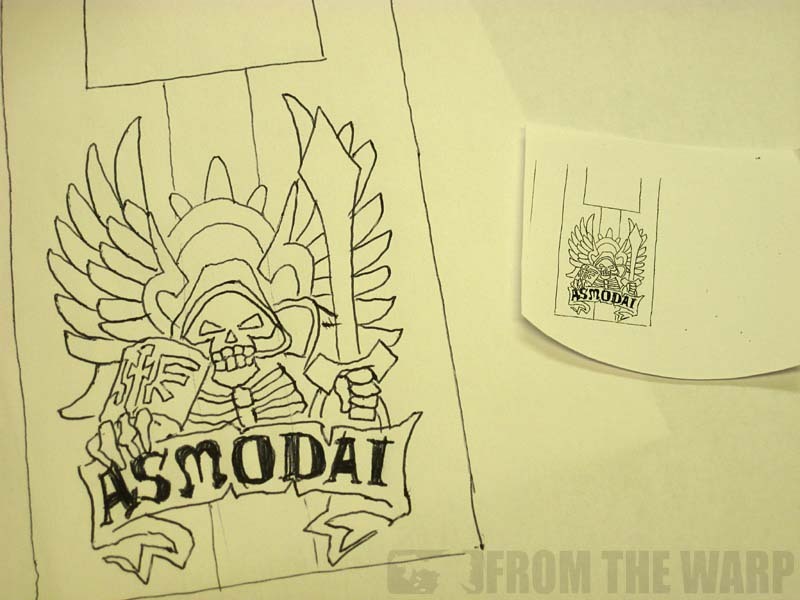 Looking forward to your progress on Asmodai. Awesome coincidence! I broke out my Asmodai model to build just the other day. Looking forward to your black recipe, I've been searching for a good one for ages. Snake88: Without getting into too much of what I have coming up in the next few weeks, let's say I had to do some more work on my "black scheme" by way of a Black Dragon Space Marine model. But now that I have it pretty much figured out, I will be doing a test model. And unless something changes (like learning a better looking way to do bone), I've dropped the bone white scheme for my Deathwing and will be going with the black scheme. ariandynas: Thanks for the offer! If I ever decide to field him, I'll definitely hit you up for them. Dims: The wash odes two things. 1. It darkens down the blue color and 2. It hides some of your mistakes when applying it. You don't have to be spot on with your feathering into the black because the wash blends it slightly. The result is a cool black with this method. 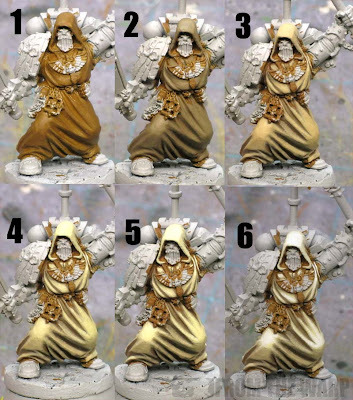 I am looking for a way/color to use to get a warm black and see how that turns out. Dugatron: There are lots of ways to go about it. It just comes down to finding one you like the look of that is something you can duplicate. Sometimes techniques are so complicated it's almost impossible to duplicate them well. Hi Ron, i've been looking at your blog for a while and I really like your painting style. 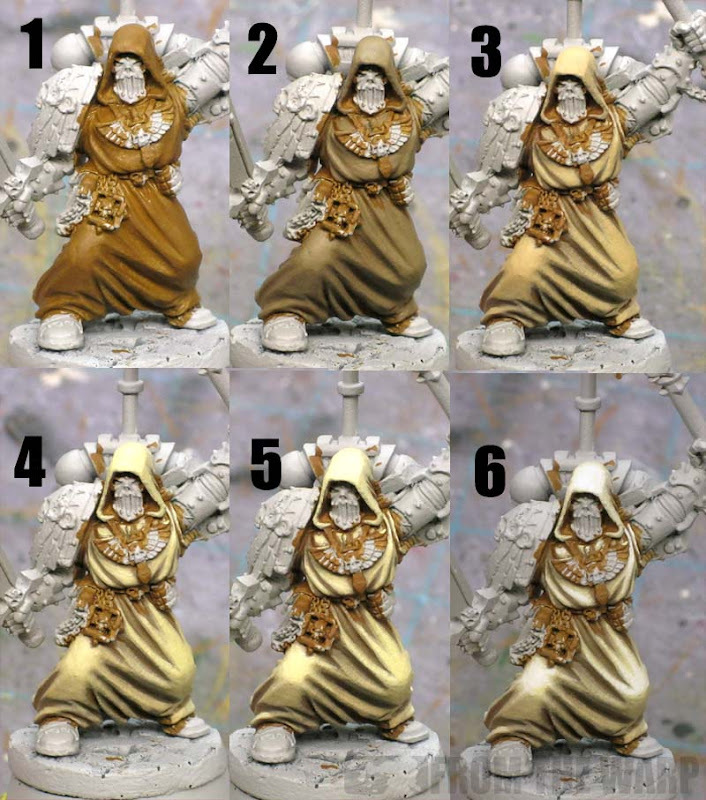 I was just wondering what other colours you used in the transition from Calthan Brown to the white on the robes? I've been holding off painting my robes until I find something that look convincing and has depth!